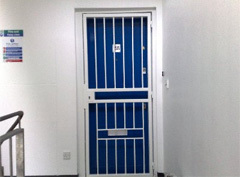 Whether you are looking for some roller shutter doors for your shop or maybe you'd like some retractable security grilles to deter any unwanted visitors, if you are looking for a security shutter installer that prides themselves in providing a high quality service, contact us today. We offer a wide range of roller shutters which cater for a variety of applications including domestic or business buildings and for both doors and windows or any other suitable opening where access control is required. 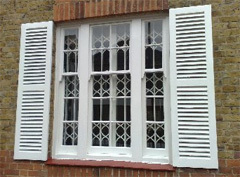 Each shutter is made to measure to your specifc requirements and is designed to compliment your premises. They can be constructed from steel or aluminium and powder coated in a wide range of colours. 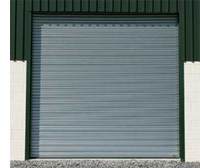 The roller shutters are available with different operating options including manual, electric, swivel or geared belt operation, using a rod crank handle or spring and lock operation. Electrically operated shutters can be controlled through key switch or a remote control and in applications with multiple shutters for convenience they can be linked to work from one remote or switch. Our retractable grilles form a powerful deterrent and when used in retail premises have the benefit of allowing potential customers to continue to view products after the premises are closed. They are able to be folded neatly to each side which can be more easily hidden away when not in use. They can be fitted in a number of configurations including face or reveal fix, floating sash, bi-parting, single, top hung or bottom rolling to meet your exact requirements. Supplied in white as standard though as with our roller shutters, they can be optionally finished in a wide range of powder coated finsihes to compliment your building or branding. 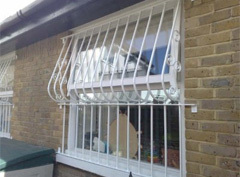 We can provide either removable or fixed window security bars and grilles which are made to measure and provide an ideal deterrent to casual opportunitst criminals as well as effective barriers against more determined intruders. Manufactured to a high quality using round or square steel bars of various thicknesses. 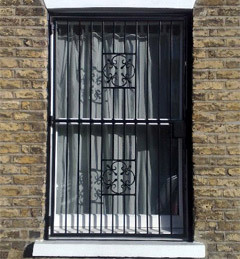 These can be formed to suit all applications such as window grilles, door protection grilles or bespoke designed grilles. Our security grilles can be made as either reveal or face fit and include cut aways for protruding window vents or letterboxes. Our removable bars feature anti-cut steel bars which are locked into position but can be released from the inside to allow total vision or window maintenance. We can also design and install attractive but robust ornamental window or door grilles enhanced with the addition of scrolls or rosettes. All of our doors, shutters and grilles are manufactured to the highest standard and our team will be able to help and advise you on the best product available for your needs and budget.